Components of a Game Engine is a primer on the anatomy of a game engine, on all the major (and minor) things that let you create entire games. Compared to Game Engine textbooks, it’s a light read, with illustrations and diagrams to help you grasp concepts quickly. What if you could create a game that was revolutionary. And best of all, you knowing that you created the game that you always wanted to play. If you understand the basics of game development but want to start building something even bigger, something special, then I can help. I built a Game Engine entirely from scratch. It was a harrowing journey. I wasn’t creating a small or simple game. Instead, I was creating an API that other people could use to build their games. And every time I hit a roadblock and had to learn something new, I wrote an article and put it up on my site. There are over 175 in-depth articles now. You can see I’ve learned a lot. Now, I know more about Game Engines than I ever thought was possible. And I want to share what I’ve learned with you. So, I’ve taken the absolute best articles and expanded upon them in my new book, Components of a Game Engine. Much of the content is entirely free on my website, but Components of a Game Engine compiles it in a single location and even provides a few updates or expansions. If you’re a future (or current) game developer, there is nothing that you could benefit from more than understanding what powers video games. Components of a Game Engine isn’t a manual or a ‘how-to’ guide. It’s a primer on the anatomy of a game engine, on all the major (and minor) things that let us create entire worlds. 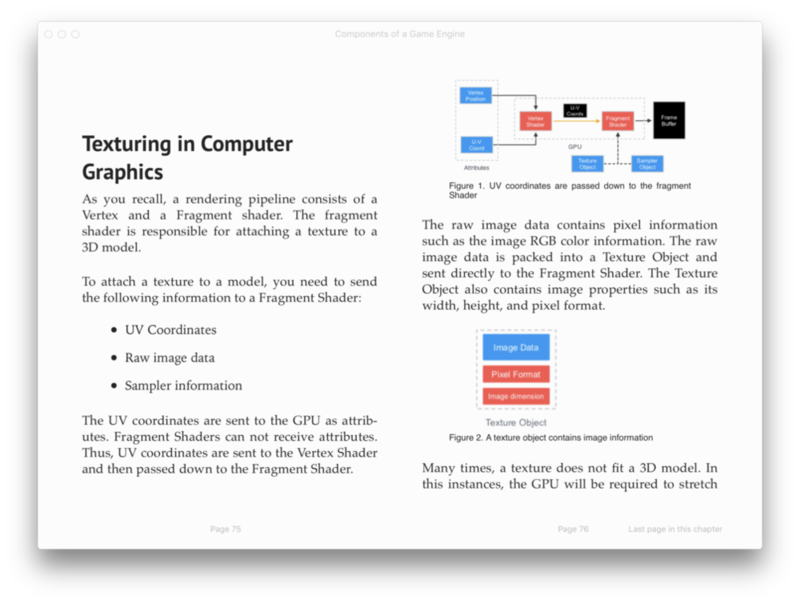 Compared to Game Engine textbooks, it’s a light read, with illustrations and diagrams to help you grasp concepts quickly. I honestly believe that if you use it right, you’ll learn how to create something truly phenomenal. Why Components of a Game Engine? What separates a brilliant developer from your average developer? An excellent developer understands what powers his games. Not in some general, abstract way, but on a much deeper level. Game Engines aren’t just another tool; they’re the very heart of game development. When used properly, they allow you to construct universes and tell stories like we never thought possible. The brilliant game developer knows this. That’s why he makes sure to understand a game engine better than anyone else. If something happens to go wrong (and when developing, something will) he can quickly find the problem and develop a solution. Minimum stress and downtime. And his understanding doesn’t just help him on a patching level; it extends further than that. One of the key aspects of creating something revolutionary is that you’re required to create or use things in ways that people haven’t even considered (or thought were impossible). But understanding your software, and why it works that way, allows you to create features that were never initially supported. In short. It lets you do something radical. Components of a Game Engine helps you understand what a game engine is, and puts you on the path to being a brilliant developer. A way that lets you see workarounds, solutions, and possible features where others only see bugs and impossibility. While you could purchase a textbook on game engine architecture, most of the literature on the subject is A) Exceptionally dense and B) Quite expensive for anyone on anything resembling a budget. Components of a Game Engine is a light, but informative read at a much more affordable cost. And, since it’s based on my experiences from developing an engine, it contains tips, notes, and knowledge that can only come from developing one yourself, an experience many authors lack. I am not the leading expert in the industry, but my credentials are better than many people who put out books on game engines. I’ve built an engine entirely from scratch, so I’m not some theorist who teaches classes and writes books in his spare time. My past few years have been entirely hands on, and that gives me a special amount of knowledge that I can share. Well, I can’t promise you anything (and anyone who does, is lying). However, I can say from personal experience that understanding the makeup of a game engine is paramount to creating a good game. Sure, you can make something playable without understanding it, but you’ll never be able to create those features that make your game stand out and immortalized.